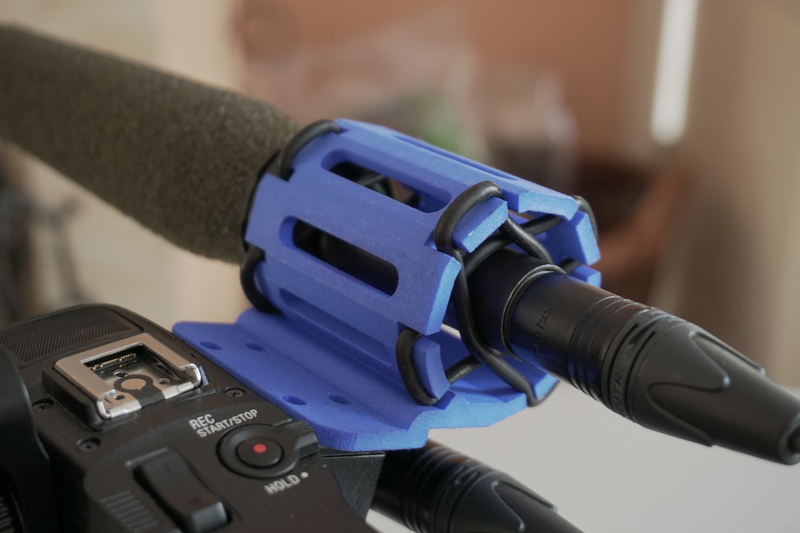 Replacement Mic Holder for the PXW-FS5 (and others). Here’s another of my “I need one of these” products. The standard Sony mic mount isn’t the greatest thing in the world. It’s a little limited as to the range of microphones it can hold and over time they become floppy and loose. What I wanted was a lightweight, sturdy, simple to use mic mount that would fit easily on to the camera without taking up either of the shoe mounts. So I designed one for myself. 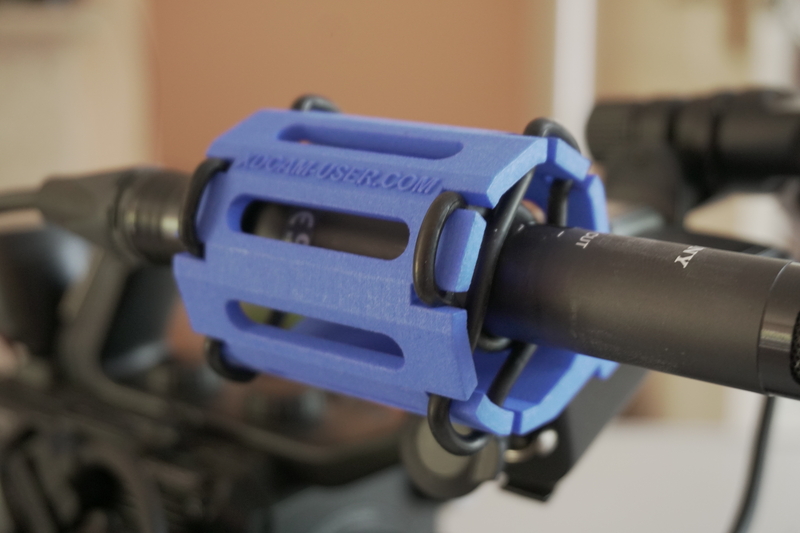 A few years ago I did a mic mount for the PMW-F5 and PMW-F55 that turned out to be be pretty popular and this mount shares some of that DNA. It’s made out of plastic and uses either rubber bands or O-Rings to give really good vibration and handling isolation. It mounts where the stock mount attaches using the two screws used to secure the original mount. There are two different mounting positions so you can adjust how far from the carry handle the microphone sits. If you want one for yourself you can order one from my Shapeways store in a variety of colours. 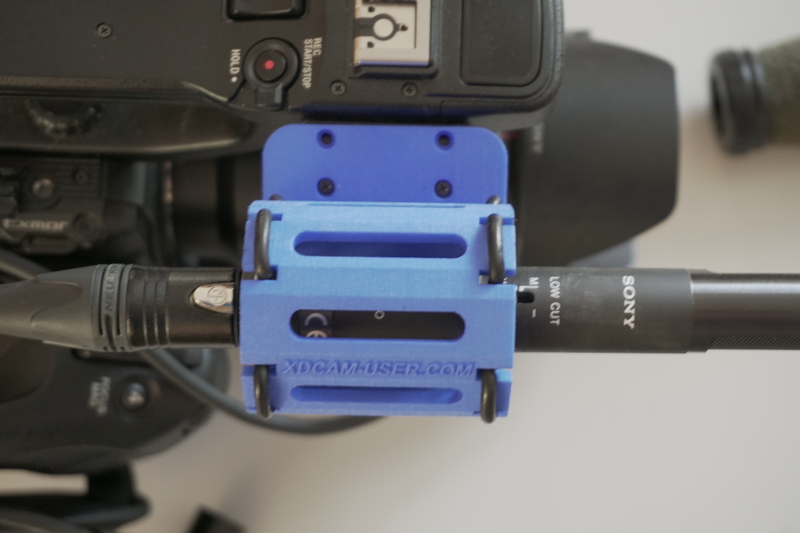 I also have a similar generic mic mount that fits many of the Sony camcorder lineup. Replacement microphone mount for the PXW-FS5. Note the two sets of mounting holes so you can choose how far the mic is from the camera body. Previous PostLog and Raw Don’t have highlight a highlight roll off.Next PostNew Venice Look LUT’s Version 3. Includes minus green LUTs. For FS5, FS7, F55, A7S, A7R. Will this fit the FS7 too please? Would have bought if they came with guaranteed to fit O rings 🙁 Half a job. Thank you very much for the other great work here though. To do that I would have to get them shipped to me first, add the O rings and then ship them on to the customer. That would add another $20 to the price for the second lot of shipping, the time taken to unpack, fit the bands, re-pack and arrange the onward shipping. In addition it would delay delivery by anywhere up to 3 weeks depending on where in the world I would need to ship them too and for many countries lead to extra import duties. They will take a wide range of O rings or elastic bands that are very easily sourced almost anywhere for just a couple of dollars. I don’t think most people would find a $20 price increase acceptable for $2 worth of O rings or a bag of rubber bands from a dollar store. Supplying O rings would mean I would have to order the parts from shapeways and get them shipped here first. Then add the O rings, then send the adapter on to wherever in the world it’s wanted. This would add $20 to the price for the extra shipping and then there would be import duties payable on international orders. I am trying to make these cost effective and affordable and I think if they were $20 to $30 more they would be too expensive. You can use easily obtainable O rings or even rubber bands which cost next to nothing. At some point you will almost certainly loose or break an O ring or bands, so you will need to find a local source for them at some point anyway. I have the generic holder. I need to replace the one on the pmw 200. What sort of screwdriver do I need to remove the old one? It looks like a very small philip. I have nothing that small in my collection. What would I ask forand where could I get them? It should fit. You need a size “0” or “00” Philips screw driver normally included in most sets of “Jewellers” screwdrivers. You should be able to get a set of Jewellers screw drivers in almost any good DIY store, ebay or amazon. Do get a good quality set so that you don’t damage the screws. It all worked! I may have done some damage working on the wrong screws but once I found the right ones (the pair inside the holder) all was fine. I found O Rings at the first auto parts shop I went to. A bit worrying though is that I was the only customer who had bought these rings, they are not in demand any m ore. I will try a sound check next week but all looks good at the moment.